Entry Fee: £60 for visitors and £35 to members of Parkstone Golf Club which includes a buffet lunch and prizes. Draw will be made at the beginning of April, any refunds after the draw has been completed will be dependent on whether we are able to find a replacement, no refunds given within seven days of the competition. Players will be notified of the start sheet by email. Rules - General conditions relating to all England Golf Championships and Tournaments will apply to this Championship. The Wimborne Cup will be decided by Stroke Play over 36 holes. The winner will be the competitor with the lowest aggregate gross score. In the event of a tie, 1st place for the Wimborne Cup will be decided through a sudden death playoff. Other tied places shall be decided on count back.The Organising Committee’s decision in all matters is final. Entries: Where entries exceed 60 in number, there will be a handicap ballot. 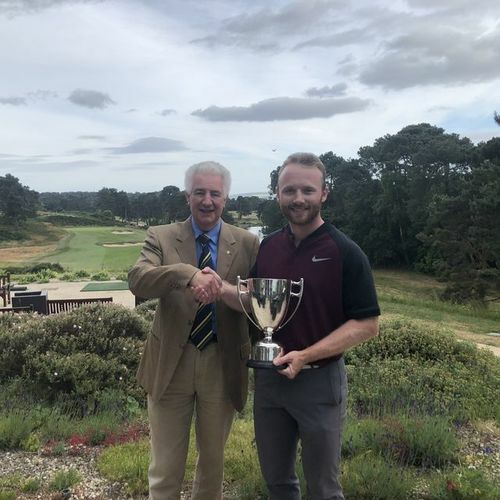 However, the Organising Committee reserve the right for 6 members from Parkstone, with handicaps of 4 or better to be included in the final start sheet, and at least 10 players from Dorset County. Practice: Competitors will be permitted one practice round during the week prior to the event, subject to availability, at a reduced rate of £35. Please telephone the Pro Shop on 707138 option 2. Prizes: The prize fund will be to the value of £1000, and shall be presented at the Club following the day’s play. Any other prizes will be decided at the discretion of the organising Committee. All vouchers will be redeemable at any PGA shop.